Do you have a headache or neck, shoulder, and/or back pain? Do you feel tired when you wake up? Sleepy during the day? Your mouth may be playing a minor or major role in how you are feeling. The Alignment of your head, bite and spine can relieve pain and fatigue naturally. Jaws are part of the whole postural chain. 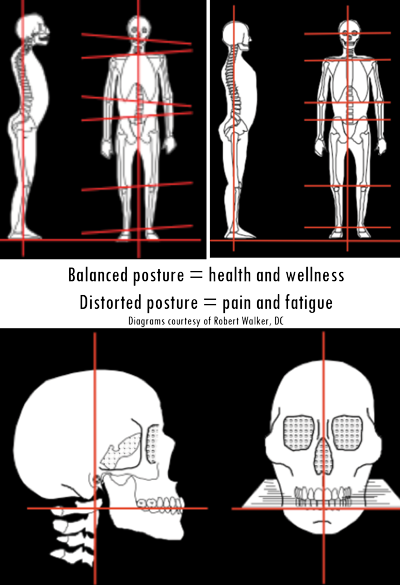 Pain and fatigue is inevitable with poor posture. Optimal health does not happen without a level head and balanced bite. Misaligned bite is a sign of skull distortion. Kids with bad bites do not perform as well in school, and suffer more pain and ear-nose-throat infections (1). Misaligned bite in adults can distort C1/C2, where the head joins the neck, to cause pain anywhere in the postural chain (1, 2). Weak chin, flat lips, facial pain come from misaligned jaws. Crowded teeth come from undersized jaws and mouth breathing (3). Full physical and spiritual health is associated with fully developed and balanced facial skeleton, wide jaws, and straight teeth (4). Dr. A.C. Fonders, author of The Dental Physician, has written a landmark summary called Dental Distress Syndrome Quantified. Click here to read the entire summary. The good news: renewed whole body health may be just one bite-correction appliance away (5). Contact us if you are interested in knowing if bite alignment may be the answer to treating your head, jaw, neck and back pain naturally. For Holistic Mouth Solutions to head-jaw-neck-back pain, see Teeth Grinding. (1) Dental Distress Syndrome Quantified, Fonder A (1987) Basal Facts, 9(4), 141-167. (2) The Quadrant Theorem. Guzay C M. (1980) Doctors Dental Service: Chicago IL.